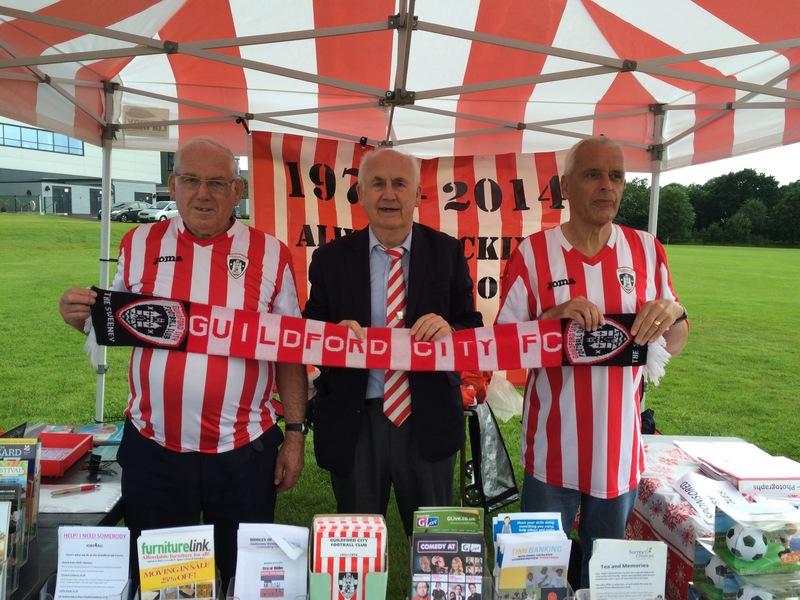 A special mention needs to be made of Guildford City’s community team Alan Wyle, Dennis May, Ray Langrish and Brian Holt who have been out and about over the summer at a number of events selling club merchandise and generally promoting the club. In addition to Guildford Lions May Day Fayre, the team with their distinctive red and white gazebo sponsored by Biddles of Guildford and Ben’s Collectors Records, were present at Compton Fete and the village fete at Shamley Green. The summer programme culminated last Friday at the Somme centenary event at Surrey Sports Park. Most of the dignitaries present including Anne Milton MP, the Lord Lieutenant of Surrey, the Mayor and several councillors plus senior military figures visited the stand and were treated to a resume of the club’s history and how we are looking forward to a bright future. Look out for the gazebo in the town centre as the team attend the Farmers’ Market on the first Tuesday of each month. « City’s pre season gets underway!